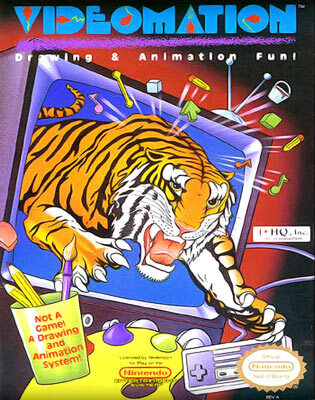 Videomation is a drawing and painting kit which enables you to create works of art on your television screen. Using the control pad, you can draw with a pencil, or you can use other video tools to help you draw straight lines, curves, circles, or squares. You can also choose how fast and in what color you wish to draw. When painting you are given a variety of (mostly pastel) colors to choose from, and you can change the entire color scheme of your work of art at any time. In addition to painting and drawing, you can add stickers (faces, hearts, etc.) and animations (dogs, a girl jumping rope, etc.) to your masterpiece. If you make a mistake, you can erase parts of the picture, or you can clear the entire screen. You can record your work using the VCR feature.